Description: Enter this striking 4/2 home in The Glades community to find a beautifully designed light & bright floor plan offering gorgeous wood & tile flooring, alcove & cutout displays, transom windows, skylights & high ceilings. Family Room anchored w/a uniquely mantled Fireplace & large picture window. Kitchen provides all matching appliances, Breakfast Bar & windowed Nook. Master Suite has garden tub w/block window, walk-in closet, dual sinks & separate shower. Split bedroom plan, interior Laundry Room w/storage closet AND Washer/Dryer. Enjoy the outdoors in the peaceful Florida Room overlooking a newly fenced backyard providing privacy & a picnic table. Termite bond. 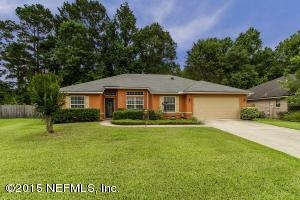 FABULOUS neighborhood in a prime location A-rated Schools close to Fleming Island Shopping & NAS JAX! Grab it now!